The Brief was just that, brief. 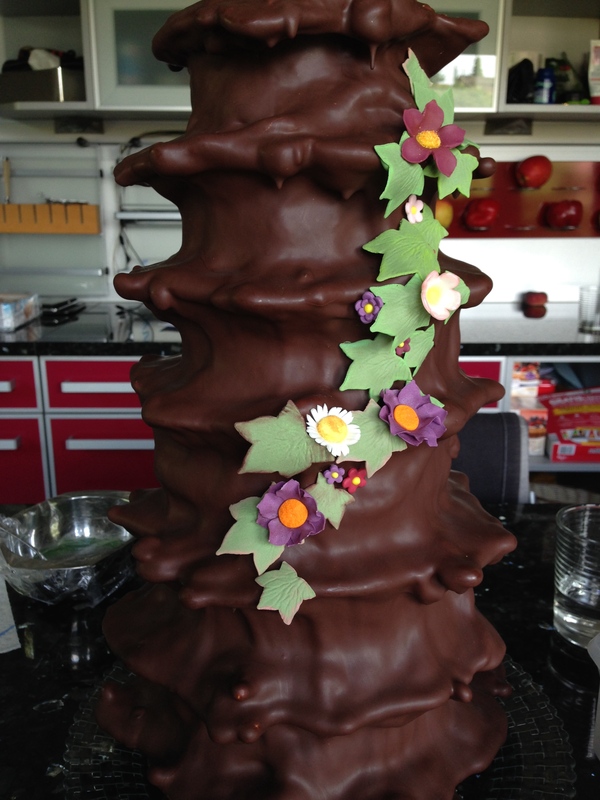 Six months ago I casually mentioned to my brother-in-law and his fiancee that if they would like some decorations to adorn their Baumkuchen wedding cake, I would love to design something. 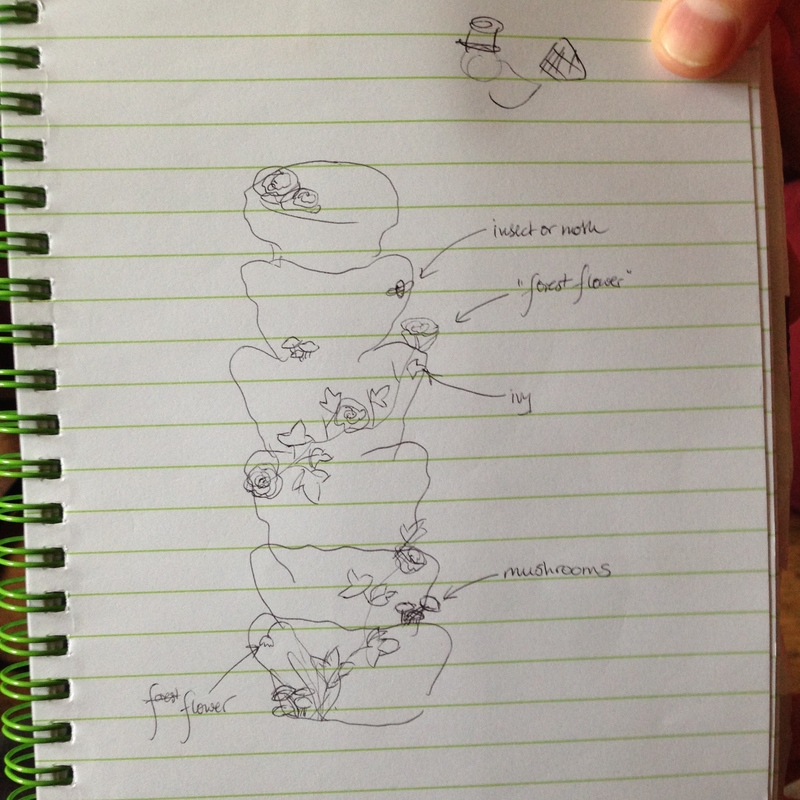 We spoke no more about it until a month ago – with their wedding plans starting to take shape, the bride shared with me a pencil sketch of a garland of wild flowers winding around the cake and a photo illustrating the colour palette of her bouquet. Mission accepted. 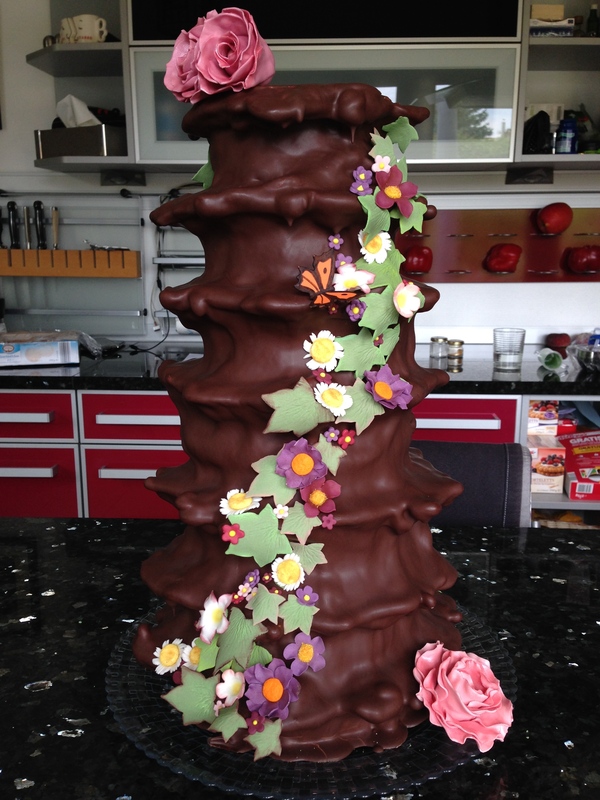 With no real idea of the scale and dimensions of the cake, or even exactly what it would be covered with – chocolate?…ganache? 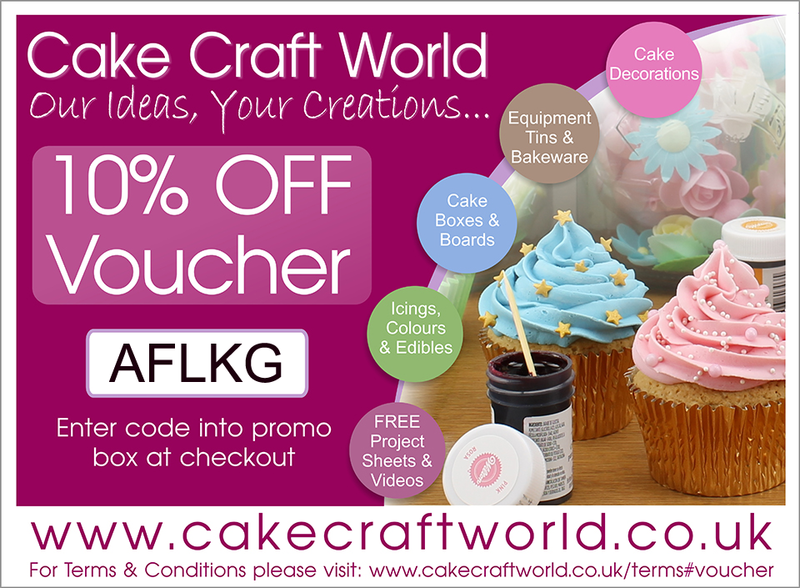 – I gathered together all of my cutters and all of my colours and set about working out how to “hack” this cake. Oh, one added complication – the wedding was taking place in Germany, so all flowers had to be able to survive an Easyjet flight. Was I confident in my flower packing abilities??? Nope! DID THEY GET THERE SAFELY?………Yes, phew! However, it was briefly touch and go when my hand luggage was searched at the airport – turns out you can’t easily smuggle a tub of fine, white powder (royal icing sugar) through security, but you can get wire cutters through in your hold luggage. 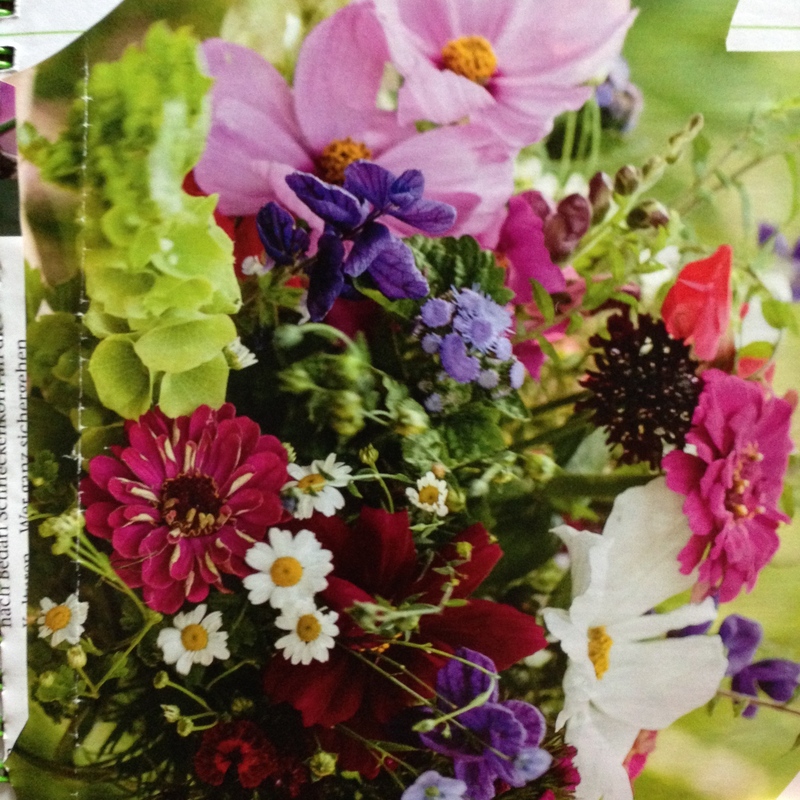 So….wild flowers. Now, I’m no botanist, but I decided I would do some flowers I know exist, like daisies and cherry blossom, and some that might exist…maybe. Ok, ok, I made them up. The cutters at my disposal were a 5 petal rose, individual rose petals, petunia, blossom (4 sizes), gerbera, ivy (3 sizes), chrysanthemum leaf, calla lily, butterfly (3 sizes), snowflake (hmmm, in May?!). In the interests of adhering to the trusty KISS* principle, I used just a handful of these. First things first, I was sure I would be able to make use of a few big ‘focal point’ style roses, so I got those underway in a dusky pink. I used the same technique as the roses on my Grandparents 70th wedding anniversary cake. Next up, some daisies. 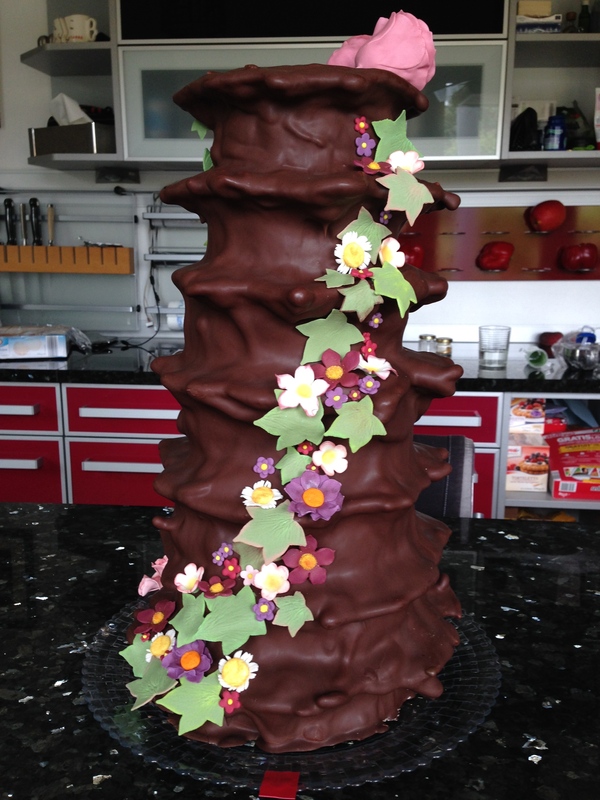 This cake presented a great opportunity to experiment with edible centres. 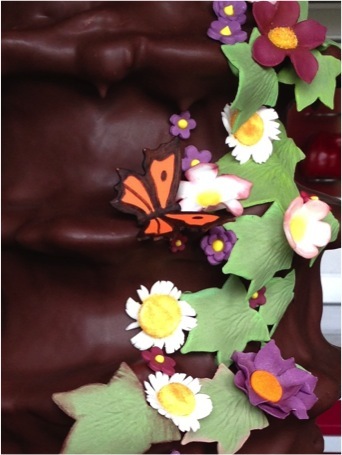 Every part of every flower on this cake had to be edible. In the interest of getting them all to their destination safely, I couldn’t wire them into sprays – instead each flower/leaf was individually attached to the cake with royal icing on arrival. 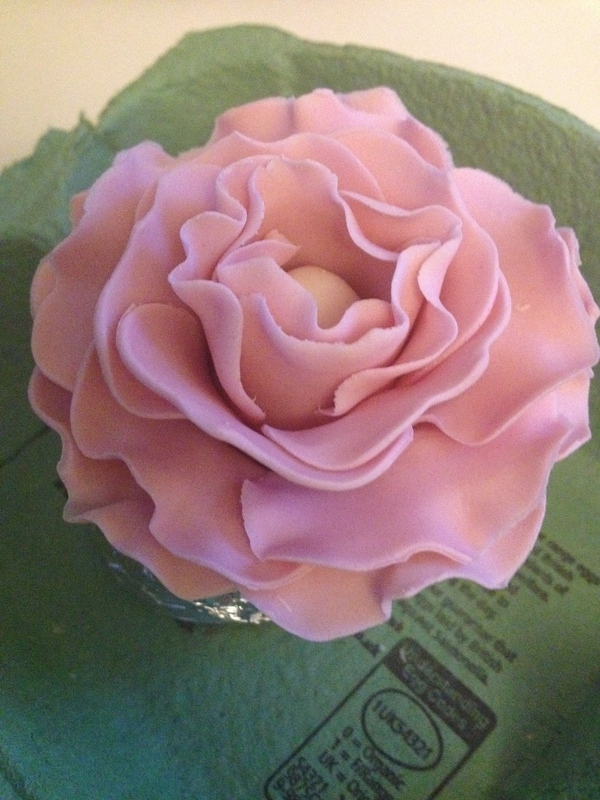 This also ruled stamens out – I experimented with rice noodles dipped in royal icing, but they were soooo delicate I abandoned this experiment. The daisies themselves were made using a blossom cutter with some snipping of the petals. The centres were small blobs of yellow sugar paste – once firm I painted them with edible glue and tossed them in a small bowl of caster sugar, coloured with Primrose petal dust. 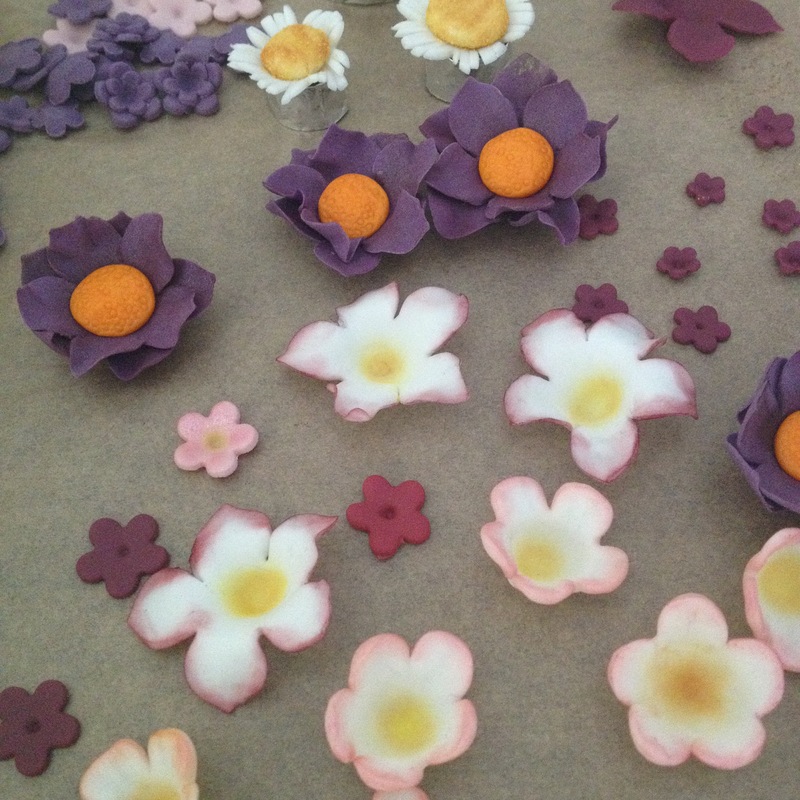 Other centres included tangerine blobs of sugar paste, indented with a small piping tube, and yellow royal icing piped into the centre of the flowers with coloured sugar sprinkled on top. The last way produced the most realistic centres, I think. 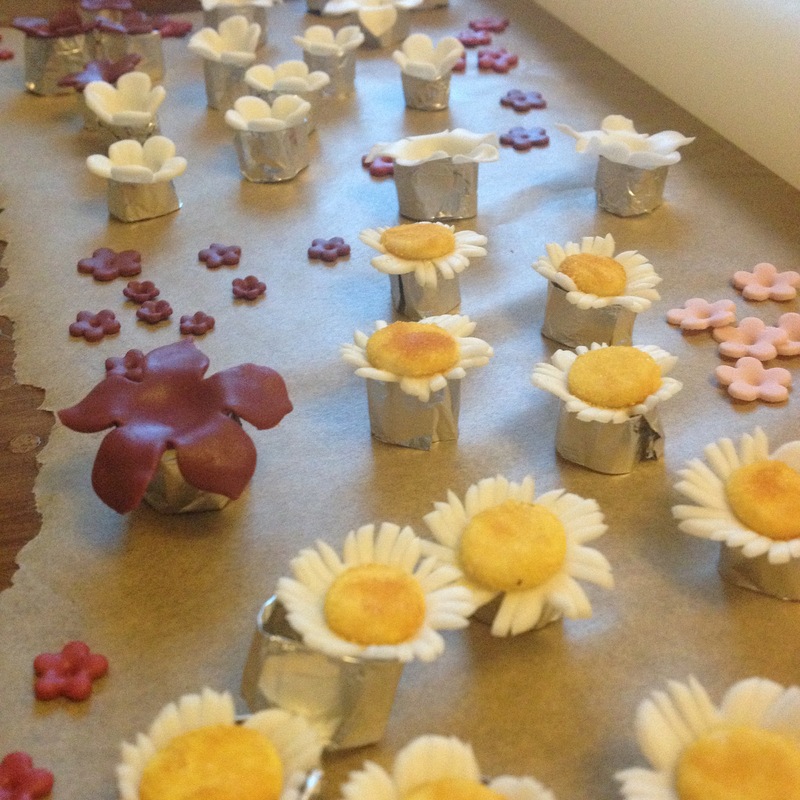 Finished sugar daisies and the early stages of some of the other wild flowers. If you’re wondering what they’re sitting on, I made tiny, tin foil cradles for each flower to dry in. 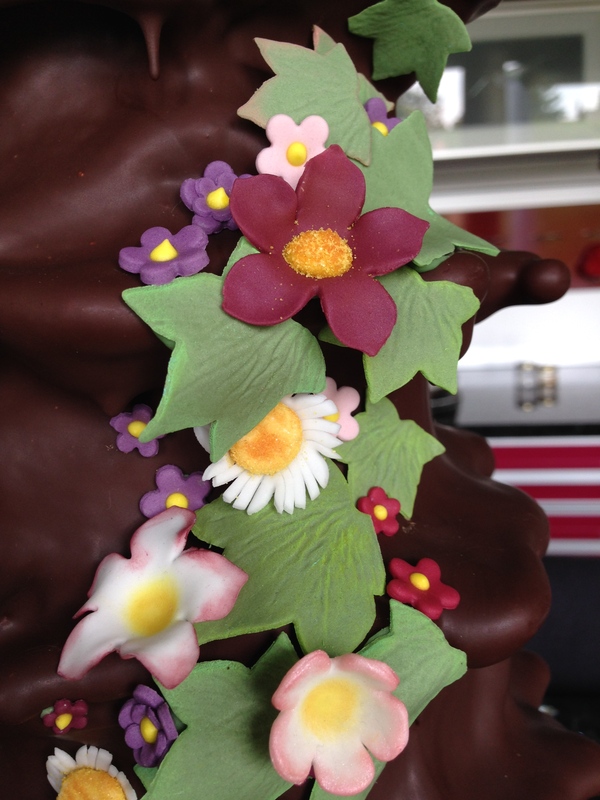 Some cherry blossom-inspired flowers and other ‘made-up’ wild flowers. The ‘filler’ leaves were all ivy – three different sizes and three different finishes. The edges of each one were brushed with either blue/green, pink or burgundy petal dust. Before setting them aside to dry on a rolling pin, which helps them look a bit more 3D and realistic when on the cake, I popped each one between a rubber veiner. 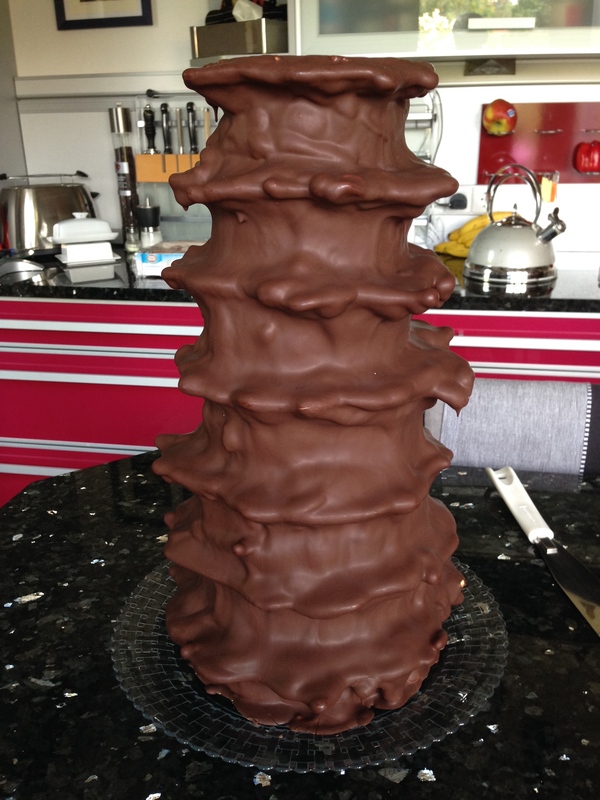 When I first saw the Baumkuchen, it was wrapped in plastic – just taking this off was scary. I mean, this thing was a whole different animal to my usual cakes. It had knobbles. Moreover, there were knobbles on its knobbles. 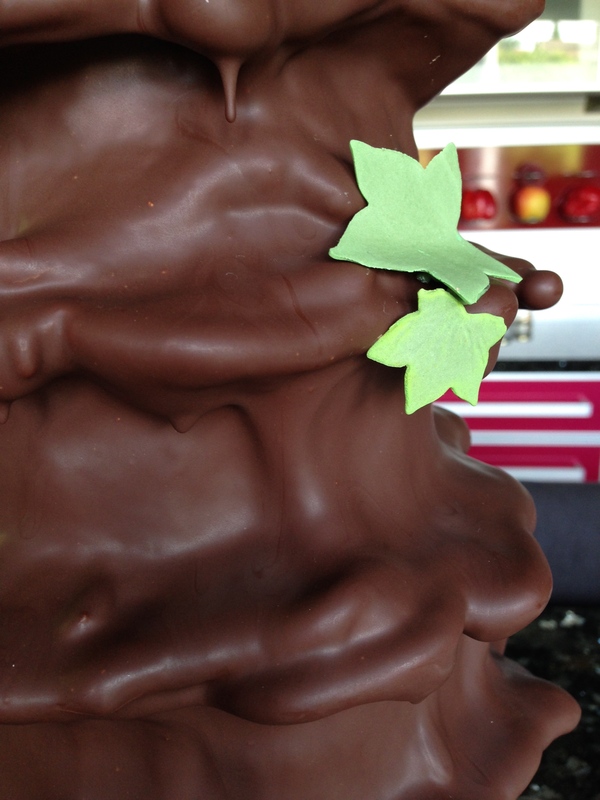 Leaf by leaf, flower by flower I started to create a cascade flowing down the cake. 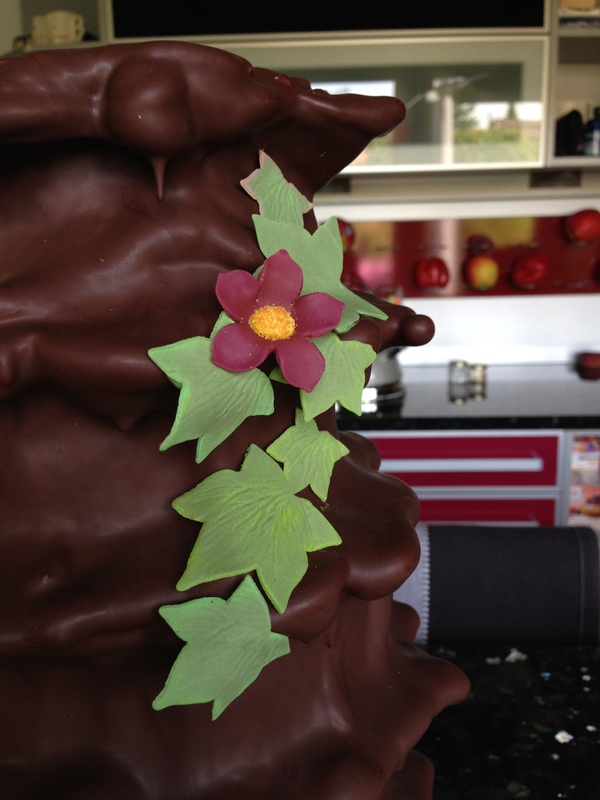 Once I’d finished the front of the cake, I realised I had enough flowers and leaves left over to also do the back – bonus! Two cascades – one on the front, one on the back. This is the back. 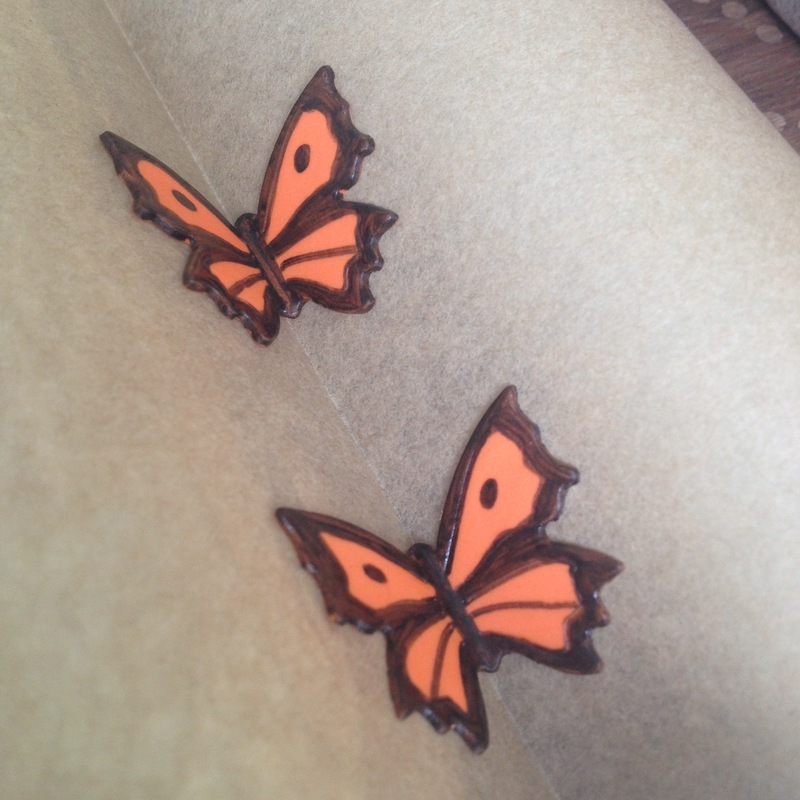 The final detail was the little Red Admiral butterfly – a special request from the bride.